The Hubble Space Telescope took images of the apparent asteroid collision January 25 and 29, NASA says. (CNN) -- A mysterious X-shaped pattern of space debris seen by NASA's Hubble Space Telescope was probably two asteroids that collided, scientists said Tuesday. The object, called P/2010 A2, was discovered in the asteroid belt between Mars and Jupiter by the Lincoln Near-Earth Asteroid Research sky survey, or LINEAR, on January 6, NASA said. 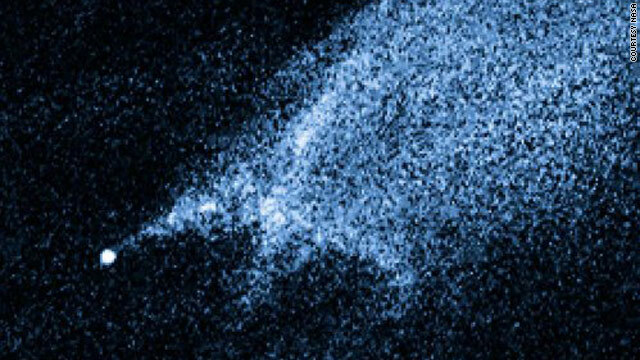 The shape, and the streamers of dust shooting off of it, were photographed by Hubble on January 25 and 29, according to NASA. Astronomers have long thought the asteroid belt is being ground down because of collisions, but such a head-on crash had never been seen before. "If this interpretation is correct, two small and previously unknown asteroids recently collided, creating a shower of debris that is being swept back into a tail from the collision site by the pressure of sunlight," said principal investigator David Jewitt, from the University of California at Los Angeles. At first, astronomers thought what they saw might be a main belt comet, a rare case of a comet orbiting while in the asteroid belt. But the images taken by Hubble revealed the complex X-pattern of filamentary structures near the object's nucleus. Jewitt said the filaments are made of dust and gravel. Some of them are being swept back by radiation pressure from sunlight, creating the long, straight dust streaks, he said. The nucleus of the presumed boom is 460 feet in diameter, NASA said. Asteroid collisions happen fast, with an average impact speed of more than 11,000 mph, or five times faster than a rifle bullet.